Helpful hints from Information Outpost staff members who have been there! Peru has a vast array of activities that will make any vacation a wonderful experience. Although most people only associate Peru with the mountainous terrain of the Andes and the Inca ruins, the country also has desert regions along the coastline and tropical rain forests in the interior. During our trip, we explored the spectacular remains of the Inca empire, hiked in the jungle, and quickly toured downtown Lima. Although we spent over a week in the country, we only visited a fraction of the attractions offered by Peru and wished we had another week to continue our sightseeing. 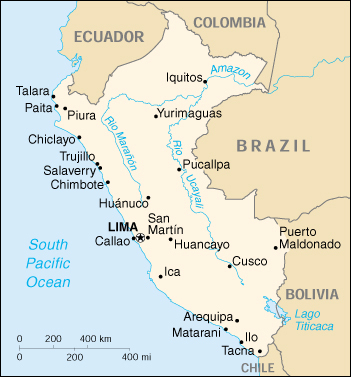 Because of our schedule, we did not spend much time in Lima. We primarily used it as a transfer point between our international flights in and out of the country and our flights to and from Cusco. We did manage to take an afternoon to drive around the city and stopped at the Gold Museum, an incredible privately owned collection of Peruvian treasures and war artifacts from around the globe. We also enjoyed the raw seafood ceviche at one of the local restaurants for lunch. We would have liked to stay in Lima another day or two to enjoy some of the other museums as well as the beaches nearby, but instead, we immediately headed for Cusco.